Free Book for Your Florida Estate Plan | DeLoach, Hofstra & Cavonis, P.A. DO NOT CREATE YOUR WILL OR TRUST WITHOUT READING OUR FREE BOOK! The truth is that estate planning has a number of potential complications and Rep's goal is to help make sure you avoid problems and that your wishes are fulfilled. Just because you created a last will and testament or a revocable living trust, does not mean that you have created the best estate plan, but this book will help clarify a number of issues to help you and your family. D. “Rep” DeLoach III is a probate, estate planning, and elder law attorney in Seminole, Florida. Rep DeLoach is Board Certified in Elder Law by the Florida Bar Association, a distinction earned by less than one percent of practicing attorneys. Practicing law since 1999, he is a well-known speaker to both the public and to the legal community. 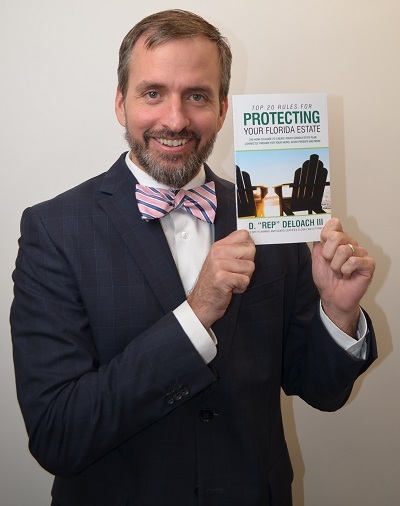 He hopes you enjoy reading this book as much as he loves practicing the law and helping his clients create the best estate plan possible. Fill Out the Form Below To Get Your Free Copy!